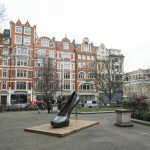 Gazelli Art House and Westminster City Council are delighted to announce the placement of Kalliopi Lemos’ ‘Stiletto Heel’ at Golden Square. 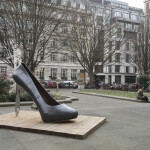 This sculpture, the latest addition to Westminster’s City of Sculpture programme, is meant to stimulate conversation and can be appreciated by all ages and demographics. 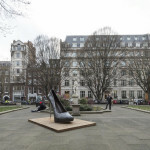 Visually stunning in hand crafted metals, this playful sculpture depicting a giant high-heeled shoe from her Tools of Endearment series, both beautifies and adorns the public spaces while paying tribute to women around the world. One of the key commitments in Westminster’s City for All Strategy (a three year vision to make Westminster a City of heritage, aspiration and choice) is to continue providing residents and visitors with the opportunity to access inspiring public art in the streets and spaces around them. This is made possible with the City of Sculpture initiative. 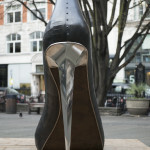 Cllr Robert Davis MBE DL, Deputy Leader and Cabinet Member for the Built Environment, said: “I am delighted that through the council’s City of Sculpture programme, Westminster is once again leading the way in thought-provoking art work thanks to the renowned international artist Kalliopi Lemos.